When I first started working in child welfare it wasn’t uncommon to hear members of the sector say that “they don’t see colour,” or that they treat all families “the same,” despite the grave disparities pointing to the contrary. All these years later, that thought process seems outdated, almost archaic. We’ve come a long way and we couldn’t have arrived where we are today without the AO Roundtable’s guidance. Anti Oppression or Anti-Oppressive (AO) practice is now understood as a framework that works towards equity (the elimination of disproportionality and disparity). It presumes that oppression is operating and that systems are not neutral. AO is action oriented, strategizing to undo oppression. In our sector, AO is important because of the power and authority we hold. Our outcomes, as evidenced by disaggregated data, suggest that we are implicated in oppressive practices as a system and as individuals. Ten years ago, the AO landscape in child welfare looked very different than it does today. Yes, there were agencies that were dipping their toe into the equity waters and doing work with marginalized communities. The Children’s Aid Society of Toronto, for example, started work in relation to their outcomes for LGBTQ communities in the 80s and 90s. By 2004, Peel CAS had their first AO (called Diversity at the time) staff lead. But it wasn’t really until the provincial Anti-Oppression curriculum was developed in 2007, that AO work started to gain traction across the province. At that time, we were a small group working on the AO curriculum, which would be followed by implementing a “train the trainer” model to ensure additional staff could be trained. When we looked around the table, we knew that as AO leaders, the sector would be turning to us for support. It was important that we had an additional body that would get together on a regular basis to provide AO leadership to the province and support to each other. That is how the Anti-Oppression Roundtable was formed. Development of the Anti-Oppression Framework. The AO Roundtable opened the window and allowed true and honest dialogue around power, privilege, social location, and non-neutrality within our sector. The AO Roundtable gave a platform to equity work and legitimized the conversation. There is no doubt that we would not be talking about Anti-Black racism today, nor would there be the One Vision One Voice project without the Anti-Oppression Roundtable. 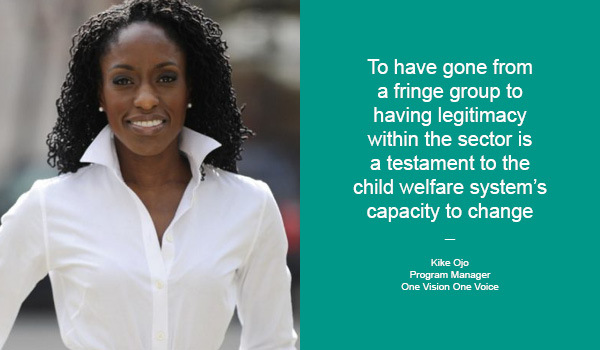 Its formation was one of the defining and most impactful AO moments for the child welfare sector. Despite these achievements, the road wasn’t smooth and it wasn’t always easy for this work to evolve. Over the years, the AO work has really been a grass roots initiative, led from the bottom up, which often resulted in challenges and resistance to the work. The work has unfolded imperfectly and some agencies are much further ahead than others. Some CASs have AO leads and others don’t. There is undoubtedly much more to do and further to go. But there is also much to celebrate. I’m thrilled that we have arrived at our ten years and I’m thrilled to continue working with people who support this important conversation. To have gone from a fringe group to having legitimacy within the sector is a lot to be proud of, and is a testament to the child welfare system’s capacity to change.